2017 is flying by and I can't believe it's only 143 days until Christmas (can you tell I'm excited?) I have had such a busy but exciting month in July. 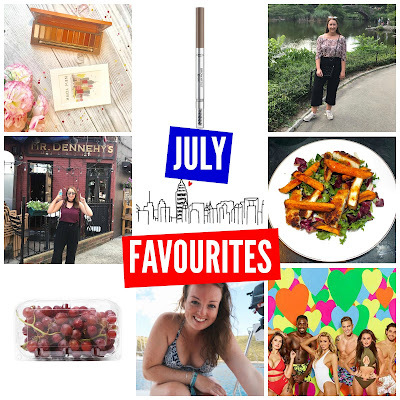 Lots going on, and trips up and down the country pretty much every weekend so I thought I'd talk you through my favourites from July. If you read one of my recent blog posts about the Urban Decay Naked Heat Palette you will know how obsessed with it I am. The colours are everything I want in a palette; warm, pigmented and a range of matte and shimmer. I have been wearing the orangey shades a lot; lumbre is my favourite all over the lid. So pretty. I have blue eyes too so I think the warm shades definitely bring out the blue in my eyes. I picked up the L'Oreal Paris brow artist xpert pencil when I had run out of my favourite maybelline one. I can't really say I picked it up because I'd heard everyone rave about it. I suppose it was more of a "oh it's on offer" type purchase but It's changed my eyebrows. I love how creamy the pencil is and it's angled so it helps me to make sure I get the right shape. I love that is has a brush on the end too so that I can tame the brows. I bought this purple off the shoulder floral top from forever 21 and I love it so much. It's a really cool material and very lightweight too. I love the colour and the off the shoulder detail is really flattering. I have been wearing it none stop and it can be worn casual with jeans or dressed up with either a skirt or culottes and heels. I've wanted a pair of culottes for a while now but I didn't think they'd suit me. I found this pair of black cropped culottes in Primark one Friday lunchtime and I couldn't leave them there. I tried them on in the changing rooms and was surprised at how much I liked them. I have lived in them this month and I like that I can dress them up or down. 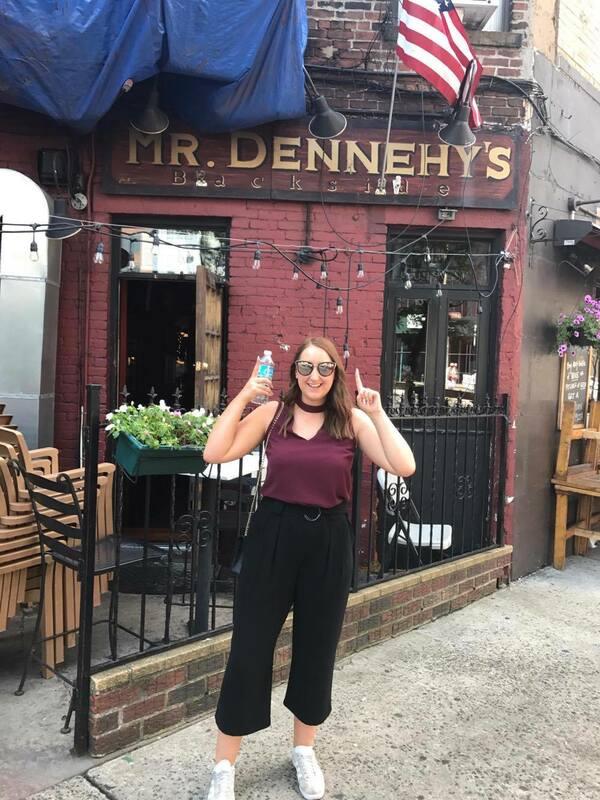 If you didn't know, I've went to New York in July and had the best time. It was so amazing and I loved spending time with my sister and mum. 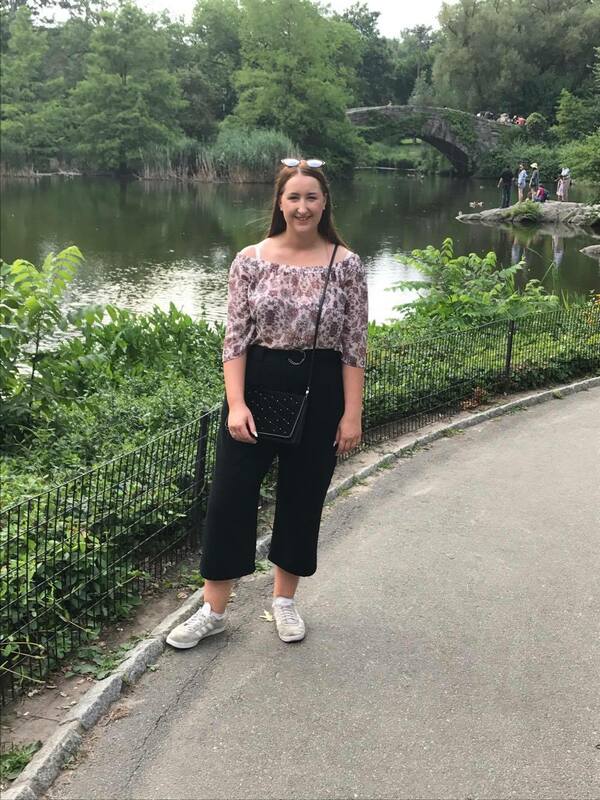 We visited all the sights, explored Brooklyn and ate lots of amazing food. If you ever get the chance to go then I would 100% recommend it. I am OBSESSED with Halloumi. It is so good. Jay and I have been putting it in everything this month! Halloumi salads, halloumi in pasta bakes, halloumi on wrap pizzas; basically halloumi everything. Mmmmm I want halloumi now! Ok so this is a very weird and random favourite but I've been loving red grapes this month. I have been eating them as a snack at work when I've felt peckish and I've been obsessed. You can buy little snack size packs from Aldi too so winner! I have been loving Brogan's weekly vlogs throughout July. I feel like I can relate so much to her and I think we'd be such good friends if we lived near each other. She's so down to earth and real. I have particularly loved her recent Med Sailors vlog and she's made me want to book a trip ASAP. If you don't follow her blog or YouTube then I highly suggest you do. Go tell her I sent you!! I cannot believe Love Island is over. If you don't know what I'm talking about then where have you been for the last 7 weeks? I've been glued to my TV screen every day at 9pm and I'm not ashamed to say it. It's been such a good series and I'm gutted it's over. It's such trashy TV but one of those programmes you just can't not watch. ROLL ON LOVE ISLAND 2018. What've been your July favourites?